At POWER UP™, our mission is to connect moments that matter for companies, events, and facilities whose guests and customers depend on a fully charged device. As the industry’s first and leading charging technology company, we offer solutions that are appropriate for all types of companies. Working closely with our team of professionals, our customers receive premium, “Made in the USA” cell phone charging products that will represent their brand well, stand up to the demands of any environment, and be supported for the life of the product. Our products are high quality, stylish, and built in Baltimore by a team of dedicated professionals. In our family of products, we have a cell phone charging station perfect for your venue, event, hospital, or office building. Read on to learn more about our cell phone charging tables that can be custom branded. Or our special cell phone charging tower that has found the right fit in hospitals all over Maryland. Read some of our recent stories from satisfied customers. What makes POWER UP™ truly unique is our approach to cell phone charging. We capture data on cell phone charging usage and provide that back to the venue or host. Our customers can use this data to make smart decisions around venue flow and determine where those “hot spots” might be located. It’s easy. Start the Rental Process Now! The POWER UP™ Charging Table is convenient and flexible for keeping attendees connected with a USB-enabled charging station that can power up to 18 phones, tablets or other devices. Personalize the charging tables with your brand to create a memorable experience. The POWER UP™ Charging Locker provides a secure way for customers to charge their devices. Lockers charge up to 24 phones or other small devices. Larger locker options available for larger devices, such as tablets. Choose RFID-enabled lockers for superior service. Share your brand’s message through a premium 28″ LED display with HD media player capable of looping mpg4 video and jpg images. Branded RFID wristbands also available. 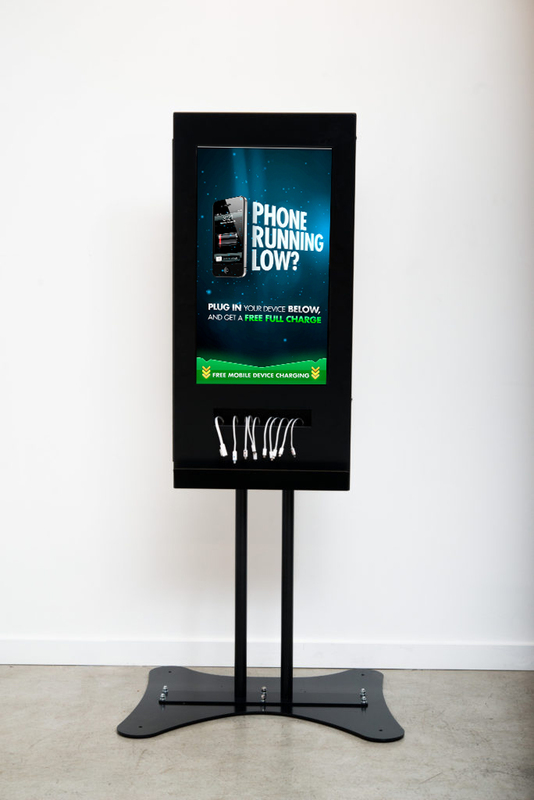 The POWER UP™ Charging Station keeps customers connected with a USB-enabled cell phone kiosk. Share your brand’s message through a premium 32” LED display with an HD media player capable of looping mpg4 video and jpg images. The POWER UP™ Slim Charging Kiosk charges 10 phones, tablets or other devices, keeping customers connected with this USB-enabled cell phone charging station kiosk. Share your brand’s message through a premium 32″ HD LED Display. The POWER UP™ Table Top Charging Bank is small and convenient, connecting your customers with 2 USB ports and 2 cables, charging up to 4 phones, tablets or other devices on any surface. Brand the Table Top Charging with your message, to elevate your customer’s experience. The POWER UP™ Charging Trailer transforms festivals and events into a premium experience. The custom branded, mobile charging station can connect up to 60 phones, tablets or other devices, serving large crowds with ease. It also includes 8 USB ports. The trailer is equipped with two 55″ premium, outdoor-rated screens and an HD media player capable of looping mpg4 video and jpg images. Solar panels can be added as an option to this charging solution. A solar-powered mobile charging trailer can also serve as a resource during emergency response situations, keeping people connected in the moments that matter. We took our flagship cocktail table and minimized floor space while providing a diverse, powerful charging solution. The POWER UP Charging Tower is made from hypo-allergenic, stainless steel which provides a durable and easy to clean solution, perfect for high traffic areas. The POWER UP Charging Tower has three standard electric outlets for laptops or other devices that require a power cord, six USB ports, and nine light-up charging cables, charging a total of 19 devices at one compact kiosk. The cables are illuminated with a red LED light while charging a device and a green LED when fully charged or disconnected, making it a simple, yet powerful solution. Interested in buying or renting?